*HealthymouthTM will not be sold OTC, through online pet stores or through discount veterinary suppliers. Currently available through company website only to meet customer needs where not yet available through their veterinarian's office. Now look at the ingredients. Which would you rather drink every day? Purified water, organic glycerine, organic pomegranate, organic yucca extract, zinc gluconate, organic blueberry, natural xanthan gum, organic papain (papaya extract), riboflavin (VitB2), ascorbic acid (VitC) organic clove extract, organic cinnamon extract, chlorophyll, sorbic acid (natural preservative from mountain berries). (cat::ESSENTIAL also contains taurine and mercury-free salmon oil as a source of omega 3). 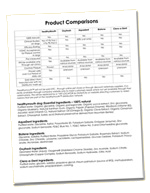 The dog and cat gel formulations also contain Sodium bicarbonate, sorbitol and extra glycerin to take the concentrate from a liquid to a gel form. Purified water, glycerine, xylitol, polysorbate 20, potassium sorbate, emilgase (enzyme), zinc gluconate, sodium benzoate, FD&C Blue #1, FD&C Yellow #5, chlorhexidine gluconate. Glycerine, sorbitol, purified water, propylene glycol, potassium sorbate, rosemary extract, sodium chloride, zinc gluconate, lysozyme, lactoferrin, lactoperoxidase, glucose oxidase, potassium thiocyonate, mutanase, dextranase. Sodium Bicarbonate, Malic Acid, Sodium Carbonate, Sorbitol, Carbowax, Cetyl Pyridinium Chloride and Sodium Saccharin.